As many of you know, Multigenerational Wealth Strategies, LLC, began when Shawn joined his father’s financial planning practice. It was important to both his father and himself that you and your families continued to receive quality advice and care in the event of a catastrophe. Unfortunately, such a catastrophe occurred and Shawn had to activate the succession plan with the passing of his father. Since that time he searched for a partner who could continue the practice in the event that he could not continue provide you with the high levels of service you are entitled to receive. And, as the recipient of a legacy business to which he has a profound emotional connection, He has very high standards when selecting a partner. Any potential partner needed to exhibit intelligence, dedication and compassion. He found the partner he sought. 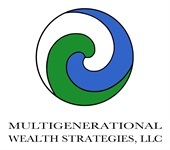 It is with great pleasure that we would like to announce that Heather Brown is now a partner of Multigenerational Wealth Strategies, LLC. Heather joined the firm almost four years ago. In that time she acquired all of the same licensing that Shawn holds, including the Series 24 (Branch Manager’s) licensing. Heather and Shawn work closely to analyze investments and meet with representatives of various investment companies. Heather has been intimately connected with daily operations of the office, and your accounts from her start. Moreover, Heather possesses attributes that cannot be taught. She is extremely hardworking and, she truly cares about you and your families. We are confident that she will continue to go the extra mile to ensure that your needs are promptly met. It is important to note that this news does not signal a change in the strategy and culture of our firm. And, Shawn is still involved in all of the decisions regarding this firm and your accounts. Many of you have asked us to structure your investments so that we at Multigenerational Wealth Strategies, LLC, can make appropriate and timely adjustments to your accounts without having to contact you prior to making those changes. To respond to those requests, we would like to talk to you about creating, or moving to, a new type of account—the “wrap account.” There are several advantages to this account. We at Multigenerational Wealth Strategies, LLC would be able to respond to sudden changes in the stock market, based on our prior conversations with and instructions from you, without having to interrupt your day. Currently, if you are not in an Advisory account (wrap account), we must speak with you directly before making any changes to your account. In many cases, these accounts may lower the annual fees you pay. Moreover, we will be able to use the same companies that you are currently invested with, as well as others, without your having to pay upfront sales charges. However, we tailor your portfolios to your needs. These proposed “wrap accounts” are not for everyone. Please contact us at 800-260-1615 or at [email protected], so that we can discuss whether a change in the structure of your investments is appropriate for you.